Probate real estate can serve as a great source of deals for those that understand how to navigate the process. 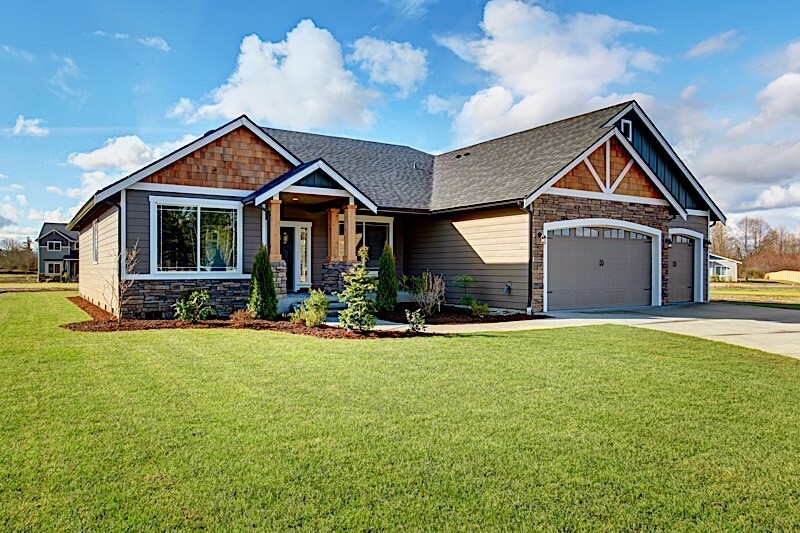 Understanding how to buy probate real estate isn’t all that difficult, and simply requires a minimal amount of time to comprehend. Probate deals represent some of the best deals for investors that know how to find them. Probate real estate has proven, time and time again, that it deserves a place amongst today’s best acquisition strategies. At the very least, those investors that are able to acquire houses in probate may find themselves with an attractive deal that’s too good to pass on. It is worth noting, however, that the process of acquiring a deal through probate strays from what the average investor is used to. There is a unique process when it comes to buying homes in probate, and it could be in your best interest to learn it. If for nothing else, understanding the basic tenants of the probate real estate process could put you on the path to finding your next deal. And what better way to understand the process than to glean as much information as you can from this probate real estate guide. What Does Probate Mean In Real Estate? Probate, at least from a real estate perspective, is another way of describing the legal process by which a decedent’s will is processed in court — a special court, nonetheless. In the case of real estate, it typically refers to the previous owner’s respective home. Let me explain. According to the Branch Banking and Trust Company, “An executor of the estate is named to handle the decedent’s affairs and administer the estate throughout the probate process. Assets that are distributed under a will (or all assets in the absence of a will or other ownership forms) go through this process and are subject to probate.” In other words, probate often refers to the administering of a deceased person’s will. More often than not, said administering will include a home — the same probate real estate investors are eager to get their hands on. But why would investors be interested in probate properties, especially when they aren’t even on the will of the deceased? The answer is simple: there are great deals to be had. You see, not everyone wants to inherit a property from a deceased relative. The recipient may not be able to afford the costs that coincide with the property, and are, therefore, more likely willing to part ways sooner rather than later; that’s where investors come in. Investors may be able to turn the new owner’s lack of motivation of owning a new property into an opportunity. Their lack of interest actually serves as motivation to rid themselves of the home, and patient investors may be able to capitalize. If you want to find probate real estate deals for your investing business, may I recommend the following process? 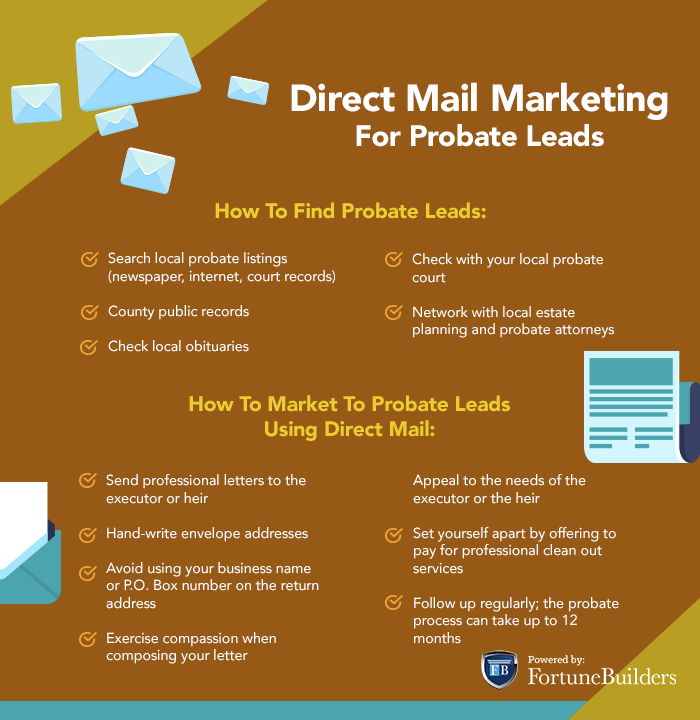 For more information on the process of buying probate real estate, the following section will breakdown each step and how you should approach a proper probate marketing campaign. If you have made it this far down the article, you have already taken what I believe to be the most important step towards buying probate real estate: educating yourself on the process as a whole. That said, I can’t recommend buying any property that has been deemed a probate until you are confident you know what you are doing. So before you go throwing out offers to every probate property that comes into your field of vision, educate yourself on what’s in store. 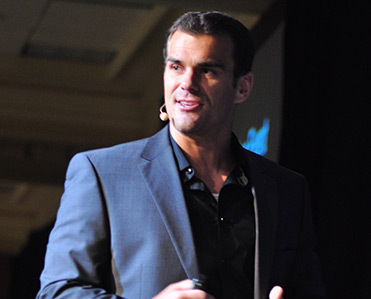 Only then will you find the entire process to be as lucrative as it has the potential to be. To expand your knowledge on the probate process, spend some time researching probates in your particular state. A simple Google search will result in a lot of valuable information. There’s no need to buy a book or anything; simply identify the intricacies that may be unique to your state, and dedicate them to memory. Take note of how probates are filed and how quickly they are filed. The idea is to become so familiar with the process that you can explain it to someone else that’s less familiar with it. You see, there’s a good chance you will have to explain what a probate is to the person you intend to buy your next deal from. And if you can ease their concerns, you stand a better chance at landing the deal. Once you are confident in your knowledge of the process, proceed to procure a probate list. As its name suggests, a probate list is just that: a list of all the homes in probate in a respective area. More often than not, you’ll be able to buy a list, as probate homes are made available to the public. However, there are some areas that don’t sell lists. If you are in an area that doesn’t offer probable lists, or you simply don’t want to pay for one, all you need to do is take a trip to your local courthouse — again, probates are public record. I maintain that pulling probate records is unequivocally better, as it’s not only free, but also more timely. Lists, on the other hand, while convenient, may contain slightly older probates or even inherited properties (which are slightly different from probates). What’s more, pulling your own list in your own neighborhood will most likely result in less competition. When you arrive at the courthouse, be certain you know what you are looking for. Ask someone where the estate sales or probates are, and they should be able to point you in the right direction. Once you arrive, enter your search criteria into the local database (it could be a computer or even a book) to identify areas and dates you are interested in. The clerk will then take the info you give them and return a pile of information, which you will then proceed to enter into your own spreadsheet. In doing so, you will end up with a list of all the properties in your area that are in probate. It’s worth noting that all the information isn’t as transparent as many would like to see. Attorneys tend to enter information into the database differently, so it may take some time to get used to knowing what to look for. By the time you leave the court house, you should have a spreadsheet detailing everything — and I mean everything. Not only should you have a list of names, properties and addresses, but you should also recognize what you have looked at in the courthouse; that way you will know where to start once you go back. With address and names in hand, create a direct mail marketing campaign. The content should be tailor-made for those in control of probate properties, and strike a chord with a specific audience. In the event you find a motivated seller through your direct mail campaign, you may find yourself with a great deal. How’s that for a probate real estate guide? If you are interested in probate real estate, know this: it’s not quick and there are a number of steps to take, outside of those that traditional acquisitions have. However, if you are comfortable navigating this real estate probate guide, you could find yourself with a great deal. Have you considered buying probate real estate? Perhaps you have had great luck doing so. Whatever the case may be, let us know your thoughts on the process in the comments below.